Of the things that are unlikely to be preserved in the fossil record, the larvae of insects with complete metamorphosis are high on the list. Usually extremely soft-bodied and (it almost goes without saying) small, even their appearance in amber (a medium conducive to the preservation of the small and soft) is rare. An additional taphonomic bias (one that affects the entire fossil record) exists against insect larvae that are not aquatic. So, the description of a fossil larva that is not, say, a Mesozoic fishfly (Corydalidae: Chauliodinae) (of which multiple specimens are known; Liu et al., 2012) is cause for excitement. Thus, the news of an indisputable rhopalosomatid larva from Burmese amber (Lohrmann & Engel, 2017) is a cause for excitement. In my case, this is due more to its familial affiliation than its mere identity as an insect larva. You may recall my mention of the Rhopalosomatidae (a small family of aculeate wasps, now one of the two families constituting the Vespoidea sensu stricto) in the inaugural post of Life, et al. : specifically, I drew attention to the oddity of their ectoparasitoid larvae (which, where known, attack crickets [Gryllidae]), which retain multiple instars' worth of molted exuviae, thus forming a protective snakeskin-like sack (Lohrmann & Engel, 2017). This "little bag of horror", as I termed it, was described in detail by Gurney (1953) in the case of Rhopalosoma nearcticum, the egg of which is characteristically placed behind the host's metacoxa, with the larva being positioned thereupon until pupation (see photographs above and below). The cricket host appears to not give that much of a frass about its terminal situation, as mating is unaffected by the presence of the immature parasite (Alexander and Otte, 1967). The amber inclusion of an unmistakable fourth-instar rhopalosomatid larva, described in situ behind a cricket's hind leg (Gryllidae; it cannot be identified beyond familial level), is a "confluence of rarities" (Lohrmann & Engel, 2017). Rhopalosomatids are rare in the fossil record, with only four fossil species having been described; of these, only Eorhopalosoma gorgyra from Burmese amber can be confidently assigned to the family (Engel, 2008). (The other three are compression fossils.) 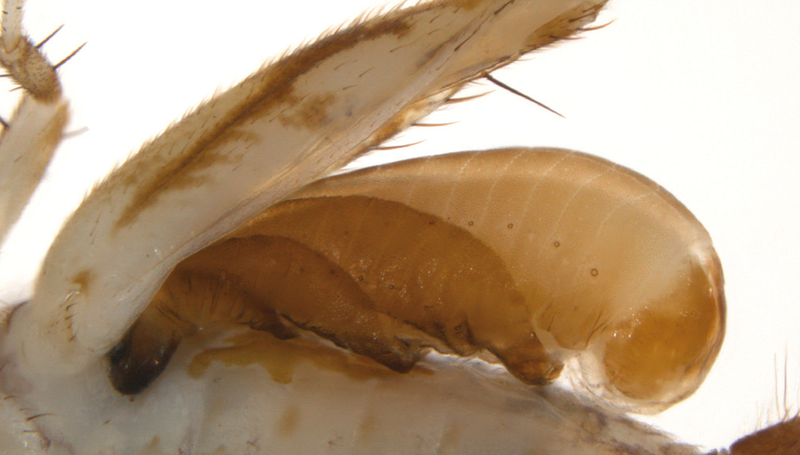 Additionally, hosts of the order to which rhopalosomatids' cricket hosts belong (the Orthoptera) are only rarely preserved in amber (Heads, 2009). The larva's exquisite preservation reveals that it is in all visible respects indistinguishable from the larva of R. nearcticum, as described by Gurney (1953). Since no other rhopalosomatid larvae have been described (Olixon australiae was reared to adulthood but never described as a larva; Perkins, 1908), however, it would be premature to identify it as a member of this New World species. Regardless of the specimen's generic identity, it is remarkable that rhopalosomatids' niche, and concomitant morphology, has seemingly changed so little in 98 million years. Alexander, R. D. and Otte, D. (1967). Cannibalism during copulation of the brown bush cricket, Hapithus agitator (Gryllidae). Florida Entomologist, 50, 79-87. Engel, M. S. (2008). 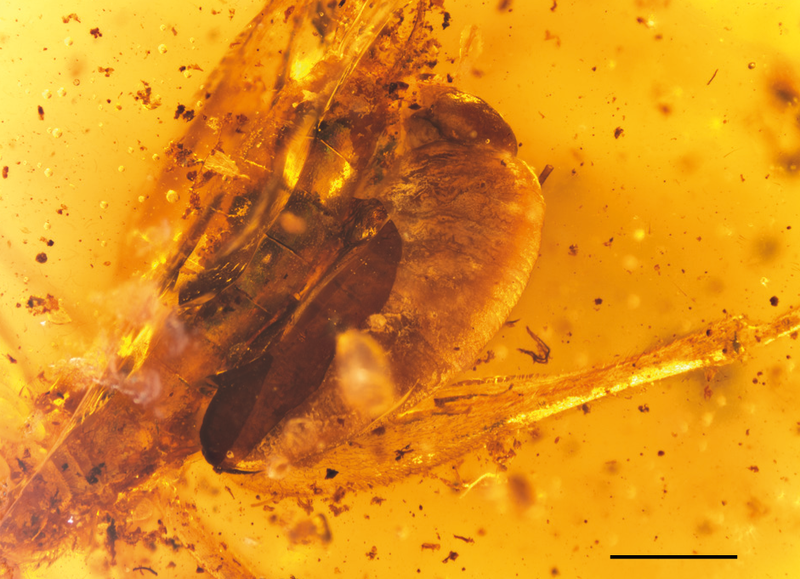 The wasp family Rhopalosomatidae in mid-Cretaceous amber from Myanmar (Hymenoptera: Vespoidea). Journal of the Kansas Entomological Society, 81, 168-164. Gurney, A. B. (1953). Notes on the biology and immature stages of a cricket parasite of the genus Rhopalosoma. Proceedings of the United States National Museum, 103, 19-34. Heads, S. W. (2009). A new pygmy mole cricket in Cretaceous amber from Burma (Orthoptera: Tridactylidae). Denisia, 26, 75-82. Perkins, R. C. L. (1908). Some remarkable Australian Hymenoptera. Proceedings of the Hawaiian Entomological Society, 2, 27-35.